Also perfect? The stock image they chose for this. There are not many songs in the canon of western music, and Al’s oeuvre, that meet the impossible standard of perfection. But “Dare to be Stupid” is incontestably one of them. It’s one of those miraculous songs where everything goes right. Devo wasn’t just the perfect act for Al to pay reverent homage to at that stage of his career; they’re kindred spirits as well, demented comic geniuses who also happen to be musical and conceptual visionaries. “Dare to Be Stupid” has a formidable legacy all its own. It was prominently featured, alongside Stan Bush’s “The Touch” (AKA the song Mark Wahlberg and John C. Riley’s characters cover, terribly but unforgettably and iconically in Boogie Nights) in Transformers: The Movie in a scene introducing the Junkions. With “Dare to Be Stupid”, Al captured the essence of Devo’s concept of “De-evolution” in a four word challenge to American consumers as surrealistic as it is irresistible and instantly iconic. “Dare to Be Stupid” isn’t just one of Al’s best, most beloved and important singles: it’s something approaching a signature song. It doesn’t matter that “Dare To Be Stupid” never charted. When assessing the boundless legacy of this preeminent American pop parodist, the charts only tell a small bordering on insignificant part of the story. Heck, “The Saga Begins” never broke the top 100 and I think it’s safe to consider that particular ditty a success. Very few of Al’s songs made the top 40 but a lot of his songs made a huge impact on fans and pop culture as a whole, particularly “Dare to Be Stupid”, a transcendent ode to stupidity by an intimidatingly smart young man. On the Ridiculously Self-Indulgent, Ill-Advised Vanity Tour Al performed “Dare to Be Stupid” every night I saw him but in a radical new context. Instead of being the greatest non-Devo Devo song imaginable, “Dare to Be Stupid” was re-contextualized as a Grateful Dead pastiche, a tribute to a forgotten number from the 1960s. It’d be hard to impinge more dissimilar artists than Devo and Grateful Dead, whose puny box set Pacific Northwest ‘73-74: The Complete Recordings Squeeze Box: The Complete Works of “Weird Al” Yankovic absolutely DESTROYED in order to win the 2019 Best Boxed Or Special Limited Edition Package Grammy yet Al’s ingenious hymn to idiocy as a lifestyle and state of mind felt just at home as a bluesy jam as it does frenetic New Wave delirium. Al had to give the people “Dare to Be Stupid” but he and the band re-imagined it so thoroughly that it took on a whole new life. It became a new song. It almost felt as if Al and the band were covering it instead of playing one of their defining smashes in a revelatory and surprising new way. 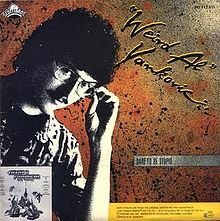 So when the “Dare to Be Stupid” instrumental appeared on the b-side of 1996’s “Amish Paradise”, which surprisingly only made it to 53 on the Billboard top 100 despite being one of Al’s best-known and most iconic songs and videos a full decade after the studio version was released as a single it was was weird, but in a good, on-brand kind of way. Unfortunately, in the decades since “Dare To Be Stupid” rampaged across pop culture the masses have seemingly embraced the song’s challenge in a non-ironic way. Al’s music has chronicled, with wit and no small level of mortification, how technology continually improves in a way that empowers mankind to become their worst, stupidest, most self-destructive selves. When “Dare to Be Stupid” was released, Ronald Reagan was the grinning, blow-dried embodiment of De-Evolution. Now we wish we were led by a leader with the intellectual gravity and fundamental seriousness of the Gipper. We as a culture and a society dare to be stupid in a way that’s no longer funny, only deeply sad bordering on tragic.